Make Christmas Magic with Portable North Pole. Portable North Pole 2017 (PNP) lets you make Christmas even more magical by sending personalized video messages and calls from Santa from the enchanted North Pole to children young and old. Watch them be amazed as they see Santa in his home, the magical reindeer, and the hustle and bustle of the elves as they prepare for Christmas Eve. 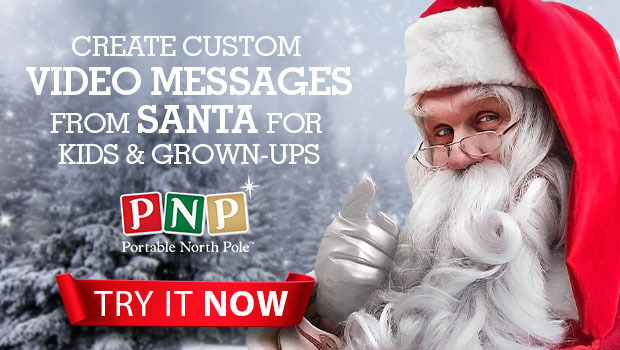 As the top free mobile Santa app with more than 160 million videos viewed, PNP is a cherished, modern holiday tradition for families worldwide. In just moments, create an adorable video from Santa that you and your child will remember forever. Simply visit the PNP website or download the mobile app on iOS or Android. PNP offers a free video for every child with a new option to purchase a single premium video ($4.99) or upgrade to a premium package, including the Video Pass ($9.99) or Magic Pass ($13.99). Both packages provide six enchanting video storylines to choose from, with each offering five or more minutes of footage to watch, from exploring Santa's workshop to the amazing gift-wrapping machine, as well as the Reaction Recorder (available on mobile app only). In addition, you can create an unlimited number of videos, and receive a special "Santa's Coming" video to watch on Christmas Eve. Plus, the Magic Pass includes HD video downloads and five weekly bedtime videos read by Santa leading up to the big day. Cassandra's Review- I love this service because it is super fun, totally legit and my kids have a ball listening to or watching the videos. You get much more than just a phone call from santa because the kids memories are going to be forever. If your family expresses a love for santa this is going to be a wonderful gift and well worth the smaller cost.